The study conducted by pulmonologists among 235 traffic policemen in the city has found that 31% of the traffic cops surveyed had reduced lung functions. 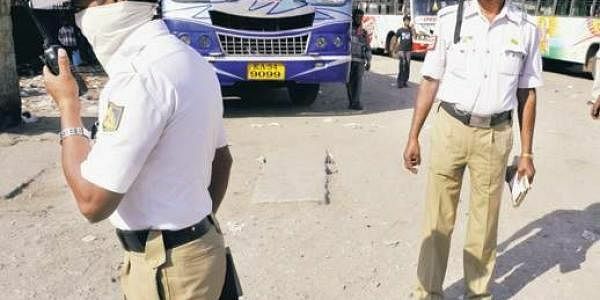 BENGALURU: In a city of 66.31 lakh vehicles, Bengaluru traffic policemen, who are managing the chaotic traffic, are more vulnerable to air pollution and respiratory problems, according to a recent study. The study conducted by pulmonologists from St John’s Hospital, NGO Anti-Pollution Drive (APD) and private firm Eureka Forbes among 235 traffic policemen in the city has found that 31% of the traffic cops surveyed had reduced lung functions and 20% of them had some form of respiratory symptoms. “This is much higher than what was found in the general population in the study that looked at the epidemiology of asthma, respiratory symptoms and chronic bronchitis in adults,” said Dr Priya of St John’s Medical College. “Police personnel, especially those on duty on the roads or in police stations located in congested areas, are prone to lung diseases caused by heavy vehicular traffic emissions, dust and industrial pollutants. They are more prone to catching allergy and infection which can lead to asthma, and in extreme conditions, can cause the incurable Chronic Obstructive Pulmonary Disorder (COPD),” said Abdullah A Rehman, founder of APD Foundation. “Our target is to screen at least 80 per cent of the traffic policemen to assess the actual impact,” he added. Many traffic personnel say they don’t have any other alternative. “I can see black dust particles on my uniform and body after a long shift. We have to stand through out the day and inhale the polluted air from vehicles,” said a traffic police constable.